Calabarzon region’s 55 caves and wetlands located within public domain or private lands and within protected areas could offer vast ecotourism potential in boosting the country’s tourism industry. Department of Environment and Natural Resources (DENR 4A) -Conservation and Development Division chief Oliver B. Viado revealed that to date, the regional agency has already identified and assessed 55 caves. Viado said that 35 of these caves have already been classified based on the agency’s guidelines on cave types while 20 others are up for classification. According to the DENR regional official, they are continuously coordinating with the Departments of Tourism (DOT), Science and Technology (DOST), Mines and Geosciences Bureau (MGB), National Museum, UPLB Museum of Natural History, National Historical Institute and local government units (LGUs) and civil society partners in coming up with the updated list of the region’s caves and cave resources. DENR is tasked as the lead agency in implementing the country’s 16-year-old law to manage and protect caves and cave resources in Republic Act 9072 through the regional cave management committee. “These classifications have restrictions based on the procedures and guidelines on whether the public could fully access the area or only a portion of the cave after the assessment and approved cave management plan,” Viado explained. DENR 4-A which chairs the regional cave management committee with the MGB as co-chair and member agencies coordinate with the LGU as host cave site on proposed co-management scheme through a memorandum of agreement. “Aside from the LGUs, we also encourage capacity building for civil society organizations (CSOs) with advocacy on the environment and natural resources conservation and engage them in ecotourism committees,” Viado said. Caves located within the protected areas or landscapes are under review and based on recommended classification by the Protected Area Management Board (PAMB), he added. “We are required to submit yearly to the Protected Area and Wildlife Bureau on our list of the region’s classified caves and publish them for ecotourism and information purposes and educational campaign,” he said. According to the DENR memo circular 2007-04, the caves are classified accordingly after their assessment on whether these are open to the public or not. Class 1 caves are generally closed to the public because of their delicate and fragile geological formations, threatened species, archeological and paleontological values and extreme hazard like difficulty in breathing when inside the chamber. According to the DENR, limited activities may be allowed related to further exploration needing expert’s assessment and for purposes of mapping, photography, educational and scientific undertakings. Class 2 caves have areas which may be partly open but there are portions with risky or hazardous conditions and contain sensitive geological, archeological, cultural, historical and biological values or high quality ecosystem. “This cave type is open to experienced cavers or assessed to have guided educational tours or visits,” Viado explained. Caves under Class 3 are assessed to be open to the public after assessment proved these are generally safe even to curious and inexperienced visitors. The cave assessment also includes finding out if there were no known threatened species and if these caves feature archeological, geological, natural history, cultural and historical values. Viado disclosed that DENR 4-A is now in the process of producing another coffee table book on the caves and wetlands of the Calabarzon region to showcase these nature’s wonders and ecotourism treasures. The regional agency also traces caves in the Calabarzon provinces through their Community Environment and Natural Resources Offices (CENRO) and the local communities. Viado said the data are submitted to the DENR Biodiversity Management Bureau (BMB) which will then issue a technical bulletin to confirm the classification and pass the processed information including the cave management plan to the LGU. Locals derive the names of the caves from their dialect and based on the description of the place or from their ancestors who knew of the local history of the place. For instance, the “Makabag Cave”, discovered in Lumampong, Indang and the only one so far found in Cavite, the “Yungib ni Ruben” in Cuyambay, Tanay, Rizal and “Sto. Niño Butas Kabag Cave” in Tala, Rizal town in Laguna, were thus named after an experience, a person or a patron saint. In Cavinti, Laguna, the DENR has classified four caves in Paowin site including its now famous Underground Cathedral Cave which resembles a cathedral and is thus believed to be a sacred site. The two others known for geological formation and being a habitat for snakes are named “Tinipak” and “Maahas” Caves, respectively and border Daraitan in Rizal to Pagsangahan in General Nakar, Quezon. 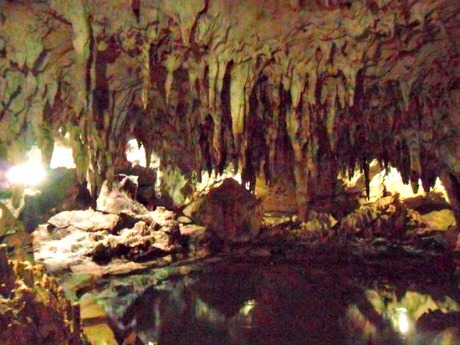 The 44 caves in the mainland towns and island municipalities of Quezon province offer enchanting experiences to adventurers, explorers, cavers, visitors and tourists for their cultural, historical, archeological, ecological and educational values. Cave sites dot practically the entire Quezon province with General Nakar - 2; Pagbilao – 2; Rizal Ilaya in Unisan – 2; Languyin in Polillo – 2 twin caves; Buenavista and Amuguis in Mulanay – 7. Tayabas City, Quezon also draws cavers and visitors to its six caves, one of which has a Chinese sounding name -- “Sung Wan Cave” -- and by the site’s geological history as “Pinaglubugan Cave” or a sunken cavern that borders Ibabang Palale in Tayabas City and Ilayang Bagumbungan in Pagbilao, Quezon. Atimonan has five caves while Perez has three, which are yet to be classified; with one each in the towns of Gumaca and Quezon. Burdeos in Polillo island has three caves also to be classified and Canicanian’s “Sumuot Cave” for Class 2 category is also found in the island.